On cold winter days, many birds come to our feeders. Unfortunately, this hawk is aware of the congregation and sits in a nearby tree waiting for an opportunity to make a meal out of one. It's hard to sit by and do nothing, but we have to let nature work things out. 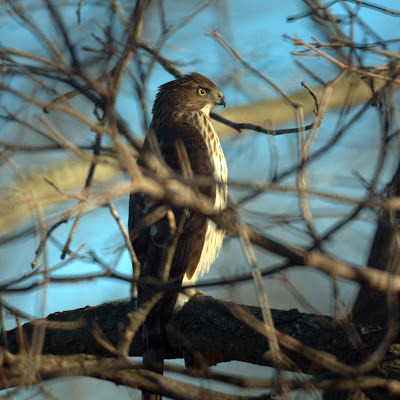 If only the hawk would go after the squirrels instead - we are having our usual winter battle with them. Chris finally decided if you cant beat them, join them and bought a corn block for the squirrels. Now they're eating that and still getting on the bird feeders!